Dance troupe Diversity, winners of TV's Britain's Got Talent, are to appear in a new British film to be shot in 3D. 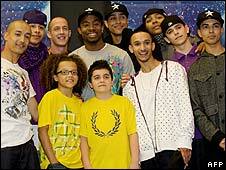 Fellow competitors Flawless will also appear in the film, as will last year's winner George Sampson. The film, Street Dance, follows a dance crew in training for the Street Dance Championships who are forced to work alongside ballet dancers. Distributed by Vertigo Films, it has been described as "the first British movie to be shot in 3D". Producer James Richardson signed both Diversity and Flawless to the film after seeing them perform last July at the UK Street Dance Championships. "I immediately started talking to them about being in the film since I felt they represented the very best of British street dance," he said in a statement. Casting is still in progress for the film, which will begin shooting in the UK in August under the direction of award-winning video makers Max and Darnia. Diversity were the surprise victors of Saturday's Britain's Got Talent final, beating hotly-tipped singer Susan Boyle into second place. The 11-strong Essex-based troupe includes three sets of brothers and has members aged from 13 to 25. London-based Flawless also competed in Saturday's final but did not make it into the final three.